It's time to update your copy of the periodic table. Four new elements discovered in recent years have now been named, pending final approval by the international group of scientists in charge of the table. 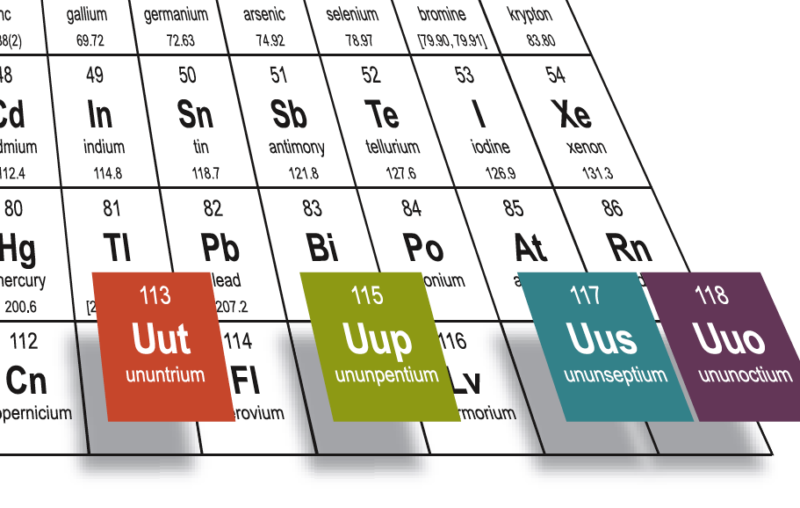 The new superheavy, radioactive elements were actually added to the periodic table late last year and given these temporary and unremarkable names: ununtrium, ununpentium, ununseptium and ununoctoium. But the IUPAC lets the discoverers of an element submit permanent names. Rules say they have to fall into one of five categories — a new element can be named after a mythological concept or character, a mineral or substance, a place or geographic region, a property of the element, or a scientist. That's how we get nihonium, discovered by scientists at the RIKEN Nishina Center for Accelerator-Based Science in Japan. 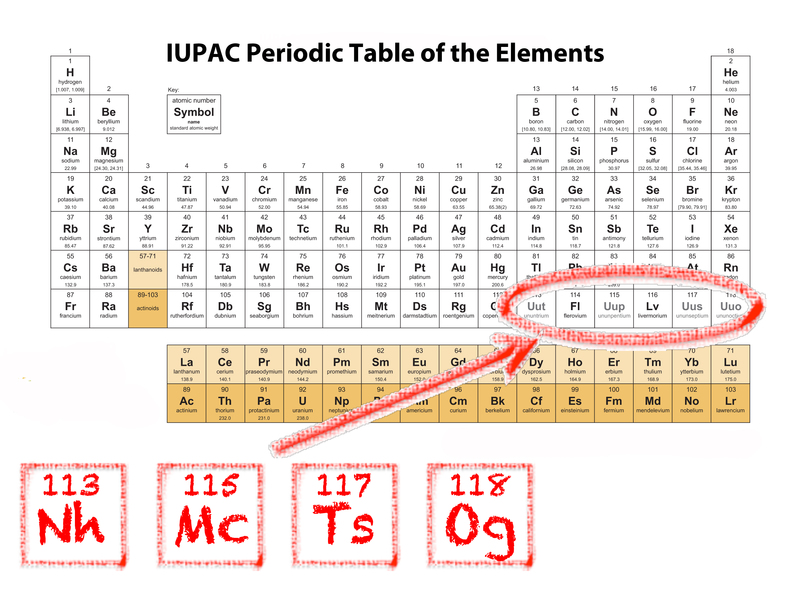 IUPAC says Nihon is one of two ways to say "Japan" in Japanese, and that element 113 is the first to have been discovered in an Asian country. Moscovium was proposed by its discoverers at the Joint Institute for Nuclear Research in Dubna, which is near Moscow. Similarly, the name tennessine is a nod to scientific contributions from Tennessee, home to the Oak Ridge National Laboratory, Vanderbilt University and the University of Tennessee at Knoxville. Oganesson was discovered by collaborating teams of Russians in the city of Dubna and Americans at Lawrence Livermore National Laboratory in California. The name honors Russian physicist Yuri Oganessian, a pioneer in the discovery of superheavy elements. He is the second person to have an element named after him while still alive. The first is Nobel-winning scientist Glenn Seaborg, who, among other things, discovered plutonium. The new names are up for public comment for five months. Formal approval by the IUPAC Council will be announced in early November. That means it's too late for the more than 150,000 Change.org petitioners who wanted to honor the late Lemmy Kilmister of the heavy metal band Motorhead by naming element 115 "lemmium."